Time to upgrade your sites again. I have finished onArcade 2.4, you can now download it from clients area. It has several new features and bug fixes, so it should be worth the upgrade. onArcade 2.4 has new template files that are completely without PHP code. Template code is basically the same as before when editing using template editor in admin panel, but now you can do this with any editor you wish. This should make template editing much easier for everybody. 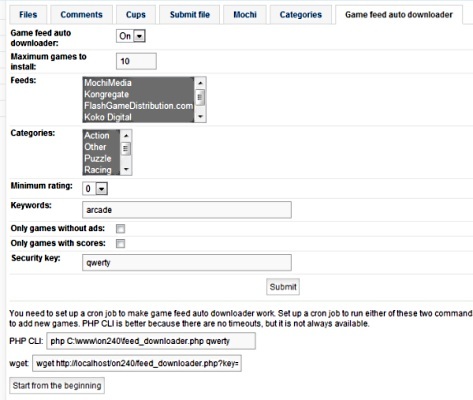 Now you can set up a cron job to automatically download new games to your site from game feeds. Now you and your site members can organize cups. Cup is an event where participants compete in several games (currently up to 5 per cup) to earn points and the one with the most points in the end is the winner. 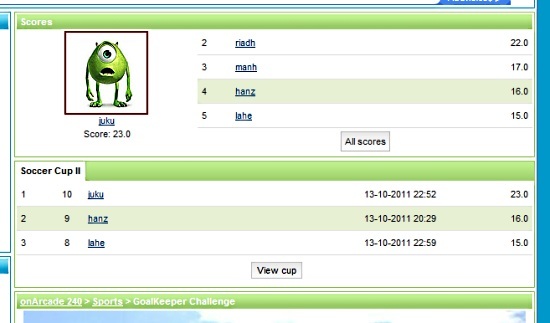 See http://www.onarcade.net/ for examples of cups. 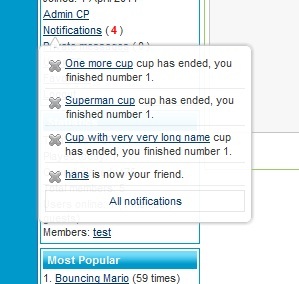 onArcade now has notifications system where you get notifications about scores, cups, friends and profile comments. There is no separate scores page anymore, scoreboard is integrated right into game page. Plus in case of Mochi games there is no page refresh on score submition, scoreboard is updated using AJAX. Add to your website code is now inside IFRAME and you can chose what is shown inside it. Favorites now have separate tab on game page and you can also see who has liked the same game. Visitors can now order category pages by title, rating, plays count or date added. Upgrading instructions are in readme.pdf file. System requirements are the same as before, PHP 4.4+ (5.2+ prefered), MySQL 4.1, allow_url_fopen on or cURL for game feeds/packs, GD + FreeType library for image verification, and Apache mod_rewrite for search engine friendly URLs. onArcade 2.4 has new template files, but old onArcade 2.3 style template files still work and with modifications it should be possible to make most onArcade 2.3 templates work with onArcade 2.4. I will be releasing these instructions soon. I will now slowly start upgrading modifications and templates, I will also post template upgrading instructions as soon as possible. Please let me know if you have any problems upgrading or find any bugs. hans .. plz i can't watch http://www.onarcade.com/forums/showthread.php?tid=3301 ?? Please send me (private message) your license key, so I can upgrade your forums account, you will then get access to all forums. I have now uploaded demo site.